So last weekend we were over at my parents' for dinner and I saw this catalog sitting on my mom's island in the kitchen. What is this? A catalog I don't get? I'm like the catalog queen. Sure, I toss them in the recycle bin as soon as they hit my mailbox should I fail to avert my eyes, but I get them all! Well, obviously not. Now most doggie stuff is a bit ridiculous. Cute, fun, but slightly ridiculous. And none of our three are little furballs that we dress up or anything. They're all the rough-and-tumble-roll-around-in-the-mud-and-run-through-the-house-hootin'-and-hollarin' type of dogs. So no fru-fru doggie sweaters or posh 3-figure cushies for our three. But OMG, I stumbled upon the absolute MIRACLE product for our crazy household. 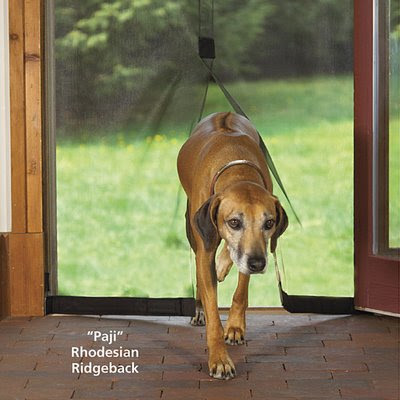 Behold, dear readers, the doggie screen door!!! This is my answer! OMG. 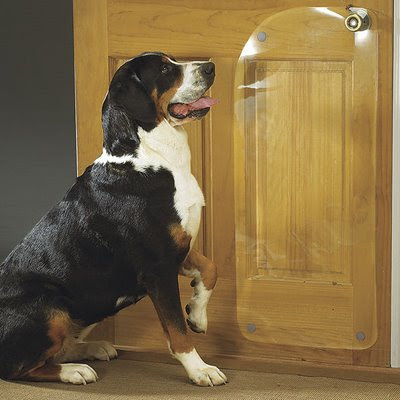 See, once it gets warm, we like to leave our back door open so our doggies can go in and out as they please. Otherwise, you're constantly getting up to let one out, let one in, let one back out, yell at one for jumping on the door... you get the picture. But of course, once summer really starts to kick in, so do the bugs. And I don't really enjoy flies and junk swarming in our home. Gertie's pretty good at catching them, but not that good. So yeah, when I saw this product I did an audible squeal and announced to the family that this product most definitely would be going in the budget next month. Hellz yeah. Lots of cool products for sure, along with some ridiculous ones, but overall, it's a fun catalog. Sign me up! I'm glad to know that others out there must have crazy untrained fools for dogs like we do. Otherwise, who else but us would need stuff like this?! Make sure you tell us how well it works! We have the same issue with our two girlies. I'm curious to see how well it stays in place, etc. I am seriously going to spend hours looking at this website. I think Darcy is going to get some new stuff! I get this catalog on occasion & while some of the items are kind of crazy, they really do have some neat dog items too. Love the screen door ... ours would love it! Perfect! I can't wait to hear a review! What great products! Thanks for sharing!